Nicole joined Watsi on July 10th, 2014. 191 other people also joined Watsi on that day! Nicole's most recent donation traveled 7,400 miles to support Sonita, a girl from Cambodia, to fund fracture repair surgery. Nicole has funded healthcare for 112 patients in 14 countries. 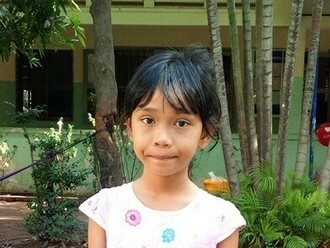 Sonita is a fourth grader from Cambodia. She has two sisters and one brother. She loves to watch cartoons, read textbooks, and play games on her phone. In April 2018, Sonita fell off her bicycle and fractured her left elbow. She is in chronic pain, and she has difficulty using her left elbow. Fortunately, surgeons at our medical partner, Children's Surgical Centre, can help. On July 10, Sonita will undergo a fracture repair procedure, which will cost $430. This procedure will help her regain mobility in her arm and elbow. She says, "I hope my arm doesn't hurt after surgery and I can return to school." Alvis is an 18-month-old boy from Kenya. He lives in Nairobi with his family of two children. Alvis's father works as a painter, and his mother stays home to care for the children. Recently, he has been experiencing vomiting and troubling symptoms. The family visited many hospitals but did not receive a diagnosis or treatment due to lack of money. Finally, the family visited our medical partner's care center. Alvis has a brain tumor. Without treatment, the tumor may lead to vision loss, brain damage, or death. Fortunately, he will undergo a craniotomy to remove the tumor on March 26. His family needs help raising $1,500 to fund surgery. “At night I twist and turn worried from the heart retching cries from Alvis and occasionally drift into nightmares of having lost him. I have faith that this will change soon,” shares Alvis’s mother. 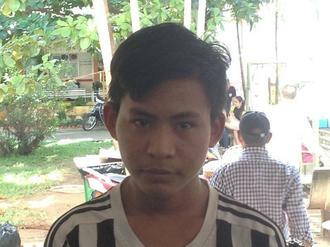 Huy is a young student from Cambodia. He enjoys watching sports on TV and going out with friends. His favorite sport is football, which he plays with his friends. In January 2017, he was in a motorcycle accident, and he fractured his right leg. It is difficult for him to walk without pain. Fortunately, surgeons at our medical partner, Children's Surgical Centre, can help. On February 5, Huy will undergo a fracture repair procedure, which will cost $430. This surgery will help him be able to walk normally again. "Ultimately, my dream is to return to good health and to have children with my husband,” shares Kyi, a 27-year-old woman from Burma. Recently, Kyi was given an ultrasound at a local clinic. Her doctors discovered a fibroid, or benign tumor, in her uterus. These growths are known to cause miscarriages and other fertility problems, a fact that has caused much stress to Kyi and her family. If untreated, the fibroid could also cause Kyi additional symptoms, such as pain and heavy menstrual bleeding further down the line. To slow the fibroid’s growth, Kyi was prescribed medication, but it has not helped. Her doctors are now recommending that she undergo a surgical procedure to remove her fibroids. 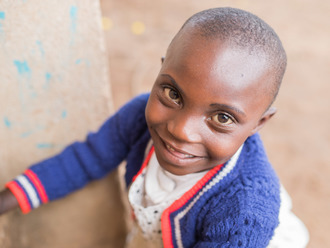 Although Kyi is eager to begin this treatment plan, she cannot afford to pay for it on her own. She and her husband earn their living by helping her parents on the family farm, but this does not leave them with much income for unforeseen expenses. Fortunately, we can bridge the gap for $960. This sum will cover Kyi’s operation on July 20, as well as the necessary lab tests, five-day hospital stay, and pre- and post-operative appointments. Let’s make sure that Kyi has the opportunity to one day become a mother. Seiyanoi is the oldest child in her Masai family. Her parents are traditional Masai herders who abide by certain traditions, including traditions regarding health and medicine. In the Masai culture, herbal medicines are the most widely used form of medical treatment. In addition to attending school, Seiyanoi assists in household duties as well as herding activities. About one year ago, Seiyanoi was burned when she stepped on hot ash. Her father has treated her burns with herbal medicine, but her injuries never healed properly. She is at risk of developing further complications if she doesn't undergo a skin graft operation. Our medical partner, African Mission Healthcare Foundation (AMHF), is sponsoring Seiyanoi's procedure, scheduled for June 13. AMHF is seeking $1,129 to cover her procedure, as well as fourteen nights of hospital stay and additional necessary medical supplies. Seiyanoi's family was able to contribute $103 towards her treatment. Seiyanoi has expressed her desire to continue her education and help her parents around their home. She says, “I want to go back to class like other children in my village." Frantz is a 12-year-old boy from Haiti. He lives with his mother, younger brother, and grandparents. His mother is a medical student, and Frantz is currently in sixth grade with a similar aspiration to go to medical school and become a doctor. Frantz was born with ventricular septal defect, a cardiac condition in which there is a hole between the heart's two lover chambers. Blood leaks through this hole without first passing through the lungs to obtain oxygen, leaving him sickly and weak. 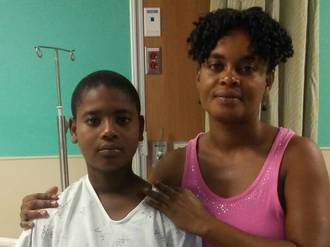 Have a Heart Cayman is subsidizing Frantz's heart surgery, however he still requires overseas transport to our medical partner's care center, Health City Cayman Islands. Our medical partner, Haiti Cardiac Alliance, is therefore requesting $1,500 to cover the costs of air transportation to the site of surgery, cardiac examinations, and medications. The treatment is scheduled to be administered on May 26 and, once complete, will greatly improve Frantz's quality of life. "I am excited for my surgery so that I can do anything I want without getting tired and having to sit down," shares Frantz.